As the NBA season enters its final leg, teams are starting to show their true colors. While we all know teams like Miami, Indiana, and Oklahoma City are the three favorites to win it all, there is another team that may just be better than all the others. That team is the Houston Rockets. With tremendous depth, strong leadership, and all around talent, the Houston Rockets are the dark horse to win the title. Lets start with the talent that Houston possesses. The Rockets have two, separate, but equal All-Stars. At shooting guard, James Harden has been stellar. Since being traded from Oklahoma City to Houston, Harden has averaged 25.5 points, 4.8 rebounds, and 5.8 assists per game. He has been a force on both sides of the floor and has become one of the most feared and respected players in the NBA. In the frontcourt, Dwight Howard continued right where he left off in Orlando. The embattled big man has averaged 18.9 points, 12.4 rebounds and 1.8 blocks per game. Since signing with the Rockets in the offseason, Howard has regained his ferocious style of basketball that we were all accustomed to seeing. Now with those two players alone, the Rockets would have a good team. However, when you look at the rest of the roster, it is an understatement to call this team great. Chandler Parsons, Terrence Jones, Patrick Beverly, and Jeremy Lin provide quality minutes night in and night out. In addition, disgruntled center Omir Asik and newly acquired forward, Jordan Hamilton, provide and even greater spark. Plenty of teams in the NBA have talent, but only a handful are eight deep. Lastly, while the talent is there, the Rockets wouldn’t be surging like they are without coach Kevin McHales discipline. The Boston Celtics legend has this team playing hard 48 minutes a night. Furthermore, with potential locker room trouble simmering, McHale has done a fantastic job of keeping all of the players on this team, happy or not, in check and accountable. 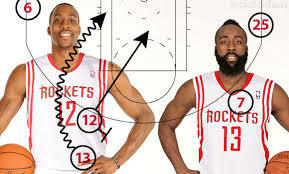 It is a mini miracle in itself that Dwight Howard hasn’t caused any problems, and the credit for that is due to McHale. Despite last night’s loss to Oklahoma City, the Rockets remain a top contender in the West. With their talent, depth, and leadership, the Rockets have the potential to win it all. Get ready to see a lot of them in May.